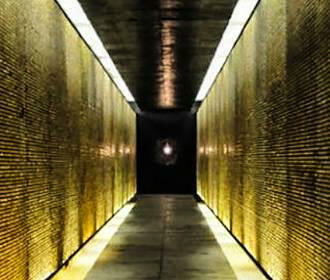 The hexagonal crypt opens onto the covered porch where there are lights that represent the deportees who died in the camps along with ashes from unknown deportees who were sent to the Natzweiler-Struthof concentration camp, which was the only Nazi concentration camp to be found on French soil during the war, that was located in the Alsace region of France. Also, on both sides of the crypt there are two small galleries that contain soil from different camps along with ashes that were returned and these are enclosed in triangular urns, which are dedicated to the French people that died, which totalled around 200,000 along with around 75,000 Jews that died at a concentration camp in Germany after being deported. And when you look around the Memorial of Martyrs of the Deportation you will see the names of different camps along with extracts from poems by people such as Robert Desnos, Paul Eluard and the famous Jean-Paul Sartre who used to frequent the La Coupole Brasserie in Paris. Plus every year on the last Sunday of April there is a memorial day held in memory of both the martyrs and the heroes of the deportation, to still remember the atrocities that took place while France was under Nazi occupation, and the horrific acts that occurred during World War II. 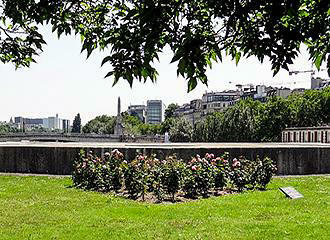 Located in the 4th Arrondissement of Paris, the Memorial des Martyres de la Deportation is located in the Square de l'Ile-de-France that is situated on the southern tip of the Ile de la Cite island in the River Seine and is also close to Notre Dame Cathedral. It is open on a Tuesday to Sunday from 10am to midday and from 2pm to 5pm during the months of October through to March. However, from April through to the end of September this monument and the crypt is open from 10am to midday and then from 2pm through to 7pm, and you will be pleased to know that there is free access to the outside and the crypt. +33 (0) 1 49 55 75 15. Now getting to the Memorial des Martyres de la Deportation is pretty easy via the public transport in Paris and the nearest Metro station is called the Cite. Alternatively, you could be travelling on the RER and then you would need the Saint-Michel - Notre-Dame stop or if travelling on the RATP then you would need the Saint Paul stop on line 1 or the Maubert Mutualite on line 10. However, the Batobus water bus as well as the tour buses in Paris will also give you easy access to this memorial in Paris. 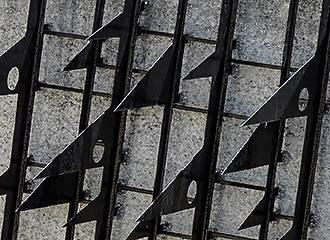 The Memorial des Martyrs de la Deportation is a monument in Paris that has a crypt, which recalls the horrors of concentration camps and remembers those who were deported and suffered the ordeals of the war. This memorial was designed by the architect Georges-Henri Pingusson and is a vast dimly lit hexagonal crypt that recalls some of the horrifying features of the concentrations camps from the imprisonment, oppression and the ordeals people went through, and the French President, General de Gaulle, inaugurated this monument in Paris on 12th April 1962.